Originally used almost exclusively for visual observing, the Lone Star telescope is fully capable of CCD imaging and data collection. 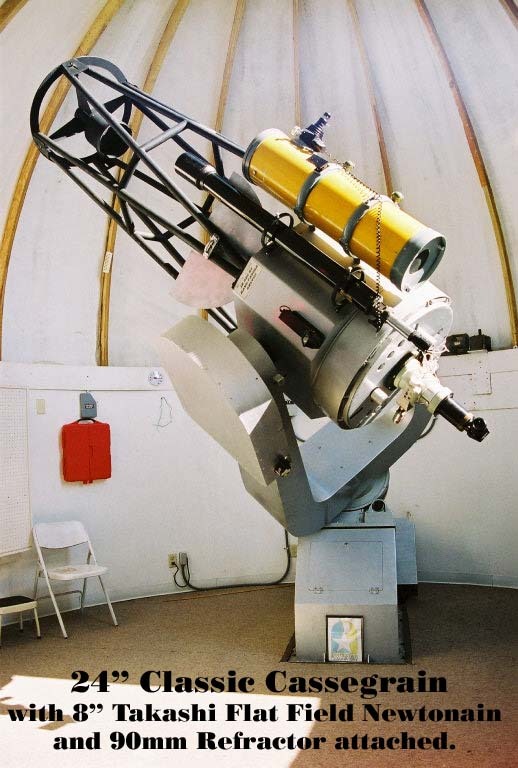 A full description of the CCD equipment owned by the observatory and available for use by all members is included in a separate tab on the opening page of the website. Although the primary optical system normally operates at f/16, a telecompressor is available for use that reduces the f/ratio to f/8. At f/16, the visual field of view is only 18 minutes of arc but yields very large and bright objects. Its special CCD equipment was sized to maximize the field of view at f/16 and has a field of 8 arc minutes. Traditionally viewed objects such as M57, the Ring Nebulae and M13, the exceptional globular cluster in Hercules, or M51, the Whirlpool galaxy, fill about 50 percent of the field of view, even with the lowest power eyepiece because of the high f-ratio. Though the field elevation of the site is less than 1,000 feet, members routinely can view galaxies with rated magnitudes as faint as 15 to 16. The planets are so bright that members normally add filters to the eyepieces to reduce the intensity of the image. With the telescope operation controlled by Software Bisque’s Professional Telescope Control System with TPoint incorporated, the system uses TheSky software package and astronomical databases as a planetarium and image display of the section of the heavens being viewed. A cursor on the screen shows where in the sky the telescope is pointing and the thousand of objects viewable in that part of the sky. To slew to any sky object the member just points to it on the computer screen with a mouse, then activates the Slew To Object button. Within seconds the object is in the field of view of the eyepiece. 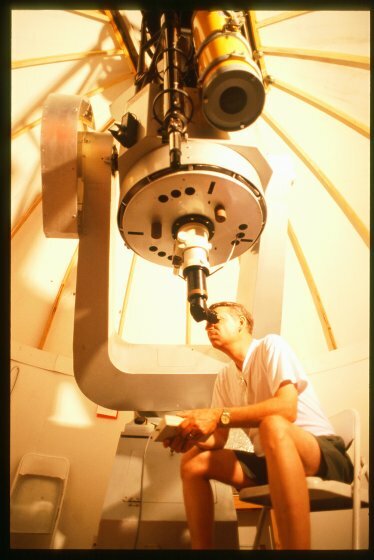 Because of the very accurate slewing, the view on the screen of the telescopic view is so accurate (1/2 an arc second), that members can center an object in the eyepiece and the planetarium software display can be used to identify the object. Objects in TheSky databases include: Messier objects (110), New General Catalogue objects (8,164), IC objects (5,398), Uppsala Catalogue of Galaxies (12,940), Morphological Catalogue of Galaxies (29,981), Perek-Kohoutek Planetary objects (1,037), Zwicky Galaxies and Clusters of Galaxies (38,511), the new Principal Galaxy Catalog, all planets, an extensive list of common name objects (Horsehead, Whirlpool, Swan, Veil, etc), provisions to input any RA and Dec, all Catalogue 1 FK-5 stars, all SAO stars through Mag 8, the Hubble Guide State Catalogue (Mag 30) of stars. LSO owns or has access to the following imaging/data collection equipment that can be used for ‘beauty shot’ imaging or data collection. Research capabilities include minor planet (meteor), comet, supernova, occultation, variable and double star investigations or searches. Primary imaging consists of imaging very faint and previously non-imaged galaxies. The organization is actively seeking spectrographs that could be used to collect data on the recessional velocity of thousands of galaxies for which no such data has been accumulated.